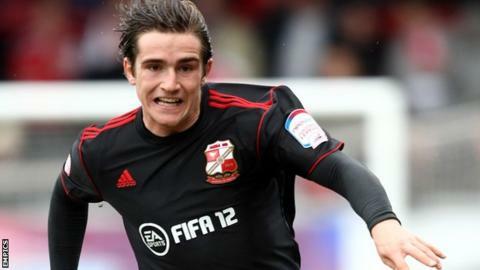 Winger Luke Rooney has welcomed his return to the Swindon squad after being exiled by former boss Paolo Di Canio. Rooney was signed by the Italian in January 2012, but found himself surplus to requirements this term and had been training away from the squad, either on his own or with the youth team. But the 22-year-old ex-Gillingham man has now returned to the side following Di Canio's resignation this month. "I feel like it's a completely fresh start," he told BBC Wiltshire. "I feel a lot more confident. I thought I was going to have to run the season out by being with the youth team or in the gym. "I've gone from not being given a chance to looking like I'm firmly back in the fold." Rooney is a product of the Gills academy and became a first-team regular in 2009. The midfielder rejected a new deal at the Kent club in 2011 and was dropped by then boss Andy Hessenthaler, before being reinstated when negotiations restarted. But, after initially turning down a six-figure fee for the player, Gillingham sold Rooney to Swindon and he signed a two-and-a-half-year deal. He made 20 appearances last season, helping Town to the League Two title, but was dropped and cast aside by Di Canio in September. "I don't want to bad-mouth the previous manager, even though I could, and probably would, get away with it," said Rooney. "People can make their own assumptions about it. I made a few rash and naive decisions myself but I think I've learnt from it." Rooney had short loan spells at Rotherham and Burton and was due to join Cheltenham Town in January before the deal collapsed. However, since Di Canio's departure he has found himself back in favour at the County Ground under caretaker player-managers Darren Ward and Tommy Miller. "I had a really good season last year - not only with Swindon but with Gillingham - and it was a rollercoaster," he added. "I've probably learnt more from this season. I'm quite mature to realise you have to learn more from the bad than the good. "I'm still only young and hopefully I can put it right."